Arctic Hare are native to Newfoundland and Labrador and are distributed throughout several regions on the island portion of the province. Population levels for Arctic Hare appear to be stable but continued research and management of their populations and habitat is important. Arctic Hare typically inhabit higher elevation areas above tree lines or in open barrens near forest. The Arctic Hare is brown or grey in summer and almost completely white in winter with black on the inside and tips of ears. 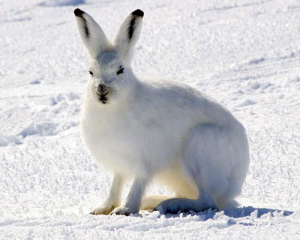 Arctic Hare are much larger than Snowshoe Hare, measuring up to 70cms. We would like your help in reporting all sightings of Arctic Hare. If you spot an Arctic Hare in your travels, please send us your findings (along with photos and GPS coordinates, if possible). Send any sightings to chriscallahan@gov.nl.ca or call 709 637-2025.